It was another wild week in the NFL and no one has any idea what is going to happen by the time this season ends. Below are my ten observations from this weekend. The Jaguars had a chance to make a big statement this weekend and take a big lead the division but failed to do so. They played the Rams this week, in a match up of the two most surprising teams thus far this season. The winner of this team would have passed a big test early in the season. The Rams look like a legitimate playoff contender, while the Jags need to figure out how to win without running the ball on every down. The Bucs got blown out by the Cardinals and might have lost Jameis Winston to injury for a couple of weeks. The Bucs got back into the game after living legend Ryan Fitzpatrick came into the game, you might have heard that he went to Harvard. The Bucs were supposed to be really good this season, but have lost two games that they should have won in the last two weeks, they need to get their stuff together before time runs out on this season. Number 8- Are the Saints good? The Saints only have turnover this season and their offense is electrifying to watch. They scored fifty points this week against the Lions and they look like a playoff contender in the NFC, they need to get their defense in order before we start thinking about playing football in January. Number 7- The Steelers might be back? The Steelers had the most impressive of the season, after beating the Chiefs in Kansas City. The Steelers are the best team in the north and even though they have struggled this season, they will walk to the playoffs and anything can happen once they get there. Giants somehow won a game this week, they beat up on the Broncos who are supposed to be really good at home. This game makes you wonder if the Giants are better without Odell Beckham Jr.? The Pats struggled to beat the Jets this week, without a conspiracy theory by the NFL, they might have lost to the Jets. The defense is really bad and they miss Julian Edelman on offense. They will get to the playoffs easily but will have problems once they get there. The Falcons blew a big lead against the Dolphins this week. The Dolphins are one of the worst teams in the NFL and the Falcons have to win this game if they want to be taken seriously. The NFC South is full of disappointments, so they still have time to right the ship. The Chiefs lost this week and there are no more undefeated teams in the NFL. The Chiefs had a disappointment this week and they have to figure things out soon. The Chiefs are run heavy and if a team can stop the run, then they can easily beat the Chiefs. After the events of Sunday which will be addressed soon, there is one clear favorite in the NFC. The Eagles had a big win on Thursday and are now the best team in the NFC. They are undefeated in NFC play and can take care of the NFC East easily, so maybe the Eagles will finally win the Super Bowl. 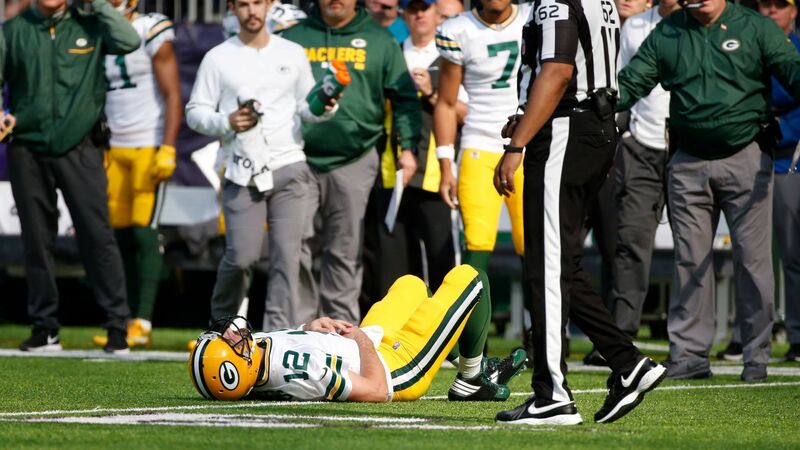 Packers lost Aaron Rodgers for the season and there are big questions at the Frozen Tundra. Will they go after a replacement with distractions like Kaepernick and stick with Brett Hundley. Whatever replacement they choose is going to be a big downfall from having the best quarterback in football. The Packers are fully pushing the panic button right now.